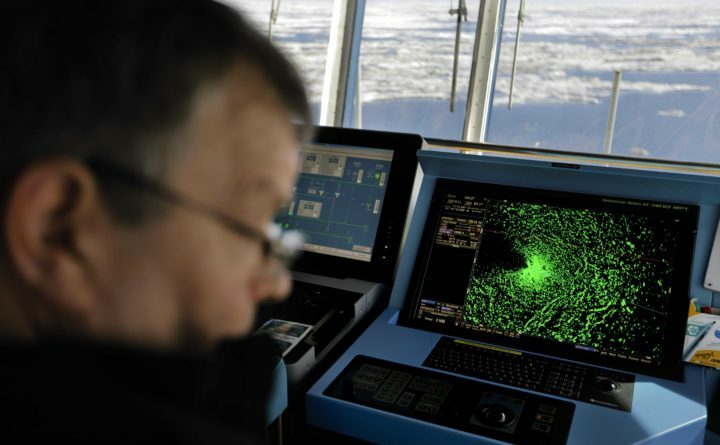 A radar shows sea ice ahead of the Finnish icebreaker MSV Nordica as chief officer Harri Venalainen navigates the ship through the Beaufort Sea while traversing the Arctic's Northwest Passage, July 16, 2017. For a moment there I thought we had a new global threat to deal with, alongside the old favorites like climate change, nuclear war and pandemics. This would have been welcome from a journalistic point of view, since there is a constant need for scary new topics to write about. Otherwise we would fail in our primary task, which is to provide material to hold the ads apart. I was also experiencing some personal indignation, since the putative new threat, the imminent reversal of the Earth’s magnetic field, was undermining one of the few practical skills I have retained from my early career in various navies: the ability to navigate by magnetic compasses. My naval career did not extend back to the Age of Sail: we had gyro-compasses and long-range radio positioning systems (although not the full satellite-based GPS of today). However, the navy in its wisdom foresaw that in a major war all the externally based navigational aids would quickly be shut down or blown away. We would still have our gyro-compass, which would tell us where True North is – but just one internal power failure and we would lose that, too. If that happened, we would have to fall back on the primary pre-20th century navigational tool, the magnetic compass, which does not depend on an external power supply. Unfortunately, the magnetic compass points to the Magnetic North Pole, which is in a different place from the true North Pole. But it was, for all of my life and indeed for many lifetimes before that, in more or less the same place. The Magnetic North Pole wandered a bit over time, but it followed a fairly predictable path around a relatively small tract of territory among Canada’s Arctic islands. So all the charts showed the difference (“variation”) between True North and Magnetic North in the part of the world covered by the chart, and even how much that difference would change each year. We were trained to add the annual shift of the Magnetic Pole since the chart was printed to the local “variation” from True North, and by applying that difference we could steer and navigate accurately using the magnetic compass. It was a skill for which there was a very limited demand but potentially useful in an emergency. Alas, the Magnetic North Pole left home about 30 years ago, and is now heading for Siberia at a speed of 60 kilometers per year. Navigators can cope with this because it’s now easy to update the information about changes in the local magnetic variation from True North. The charts are actually computer programs these days, and the relevant authorities are just updating them more frequently than they used to. The worry is that this sort of behaviour by the magnetic pole may be signalling an impending “flip” in which the north and south magnetic poles change places. This has happened before – indeed, the Earth’s magnetic field has reversed its polarity at least 183 times before, according to the geological record – and it makes no long-term difference. It will now be the other end of the needle that points to “Magnetic North,” but the magnetic field will still fulfil its primary function of trapping the high-energy particles that would otherwise bathe the planet’s surface in radiation. The scary bit is the transition, which can take as long as a thousand years or as little as one lifetime, because during that transition the strength of the planet’s magnetic field falls to around 5 percent of normal. If the ozone hole worried you a bit, this should frighten you to death – and the strength of the magnetic field is already falling. That was my initial reaction to the news. Every decade seems to bring news of yet another way that the universe can kill us. But not, it turns out, this one. The consensus among scientists is that the surface of the planet is not bombarded by hard radiation during the intervals when the Earth’s internally generated magnetic field all but disappears for a time. Instead, the solar wind itself induces a magnetic field in the extreme upper limit of the planet’s atmosphere (the ionosphere) that stops incoming high-energy particles from reaching the surface. We may have the opportunity to check the validity of this prediction in the relatively near future, but for the moment there is no need to panic. And if you’re lost in the woods (or at sea), you can still trust your compass. More or less.